Who’s Quitting With Me? Quit Tea Giveaway! This giveaway has closed and the winner has been notified via email. If you entered please make sure that cwigs@live.com is on your safe senders list. Thank you to all who entered, and please check back often for more great giveaways!! I am happy to report my quitting smoking is going well. I haven’t stopped completely, but rather chose to ween myself off over the next couple of weeks. This week I have gone from smoking about a pack-a-day…AWFUL I know..to half that. About 10 cigarettes a day. This is still a ton, but I know that I wont be able to quit cold turkey after 10 years, and I am not going to try. I have a feeling that if I do that I will be more likely to give in to the urge to smoke. However, I am ecstatic to announce my Quit Tea Giveaway!! One lucky “Quitter” will have the chance to join me in this journey!! 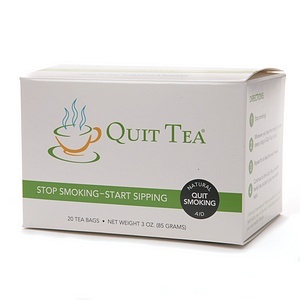 I am giving away 2 boxes of Quit Tea to help you in your quest to quit!! Leave a comment answering this question: What made you decide to quit smoking? Please leave a comment for EACH extra entry method you choose. This way you will get the correct corresponding number of entries. This Giveaway will close Monday June 11, 2012 at 12Noon CST. Winner will be chosen using Random.org. The winner will be notified via email and has 48 hours to respond. If no response is received a new winner will be chosen.